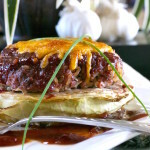 Deconstructed Cabbage Rolls - What the Forks for Dinner? I have so many memories that involve food……..Sunday dinners, special holidays, and those times that you were made that extra special thing, just because…….. In our eclectic family, we had several “Aunts” who really weren’t are Aunts, but we called them that anyway. So, it was with my Aunt Sis, whose real name wasn’t even Sis it was Yvonne. Now, she was a woman who could cook you the best, down home cook’n ever! Her claim to fame were her cabbage rolls……they were to die for. She would invite us to her small little apartment and cook up a huge pan of cabbage rolls. I wish I would have had her show me how she made them. She is gone now, but the memory of the cabbage rolls is still strong. So, in tribute to my Aunt Sis…….Deconstructed Cabbage Rolls. I could never improve on her cabbage rolls so, I took a different route. Instead of all the boiling of the cabbage and rolling up the neat little packages, I wanted to simplfy the process. I have seem many recipes for roasted cabbage and all of them rave about how good it is…….the wheels are turning now! So, here is what I did……..instead of boiling the cabbage, I cut it into slices. The slices of cabbage went on a sheet pan sprayed with nonstick spray, with salt and pepper. I made just a basic cabbage roll stuffing with ground beef, rice, tomato sauce ….you know the normal things. I made a slightly spicy sauce……..for Tim of course 🙂 Placed the ground beef mixture on the cabbage slices, topped it with the sauce, into a preheat oven…..Deconstructed Cabbage Rolls. I did top them with cheese, you know for a little some’n, some’n. They turned out great. They definitely were not my Aunts, but they were really good, and not as hard to make. In fact, you can make them ahead, either up to the point of cooking them ,or go ahead and cook them and reheat them later (we ended up doing the later). 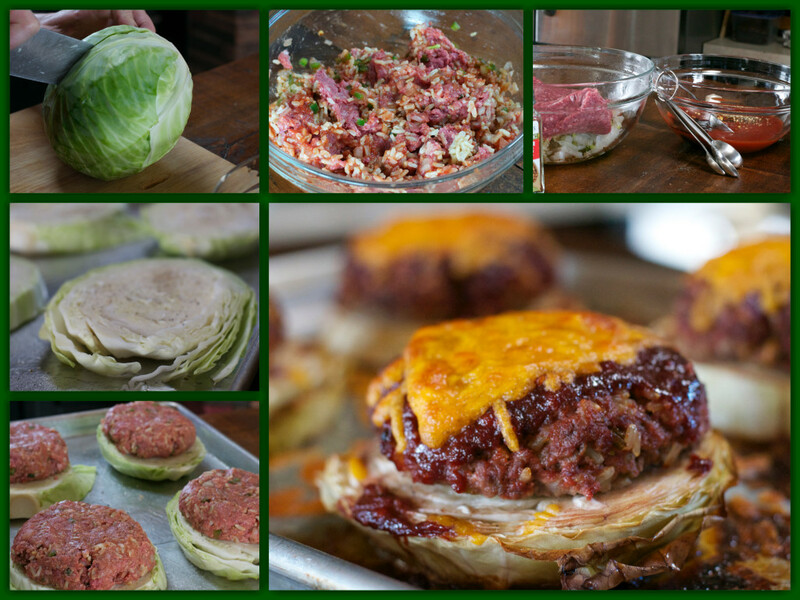 Tim even made a “burger” out of one of them………hmmmm Cabbage Roll Burger?????? In a large mixing bowl combine ground beef, rice, 1/2 cup tomato sauce, garlic, garlic pepper, onion, and green pepper until well blended. Set aside. Wash and trim cabbage. Cut into 4 slices. Start by cutting the cabbage in half through the core. Do not remover the core this will allow the slices to retain their shape. Cut the halves in half again to get four slices, removing a sliver from each round side so the slices lay flat. Place slices on a cookie sheet sprayed with non-stick cooking spray. Season slices with salt and pepper. In a medium bowl mix remaining tomato sauce, balsamic vinegar, garlic pepper, brown sugar and a pinch of red pepper flakes. Set aside. Divide the meat mixture into four equal pieces. Place one piece on each slice of cabbage flattening slightly. Spoon sauce over meat mixture. Save some sauce to garnish the plates. 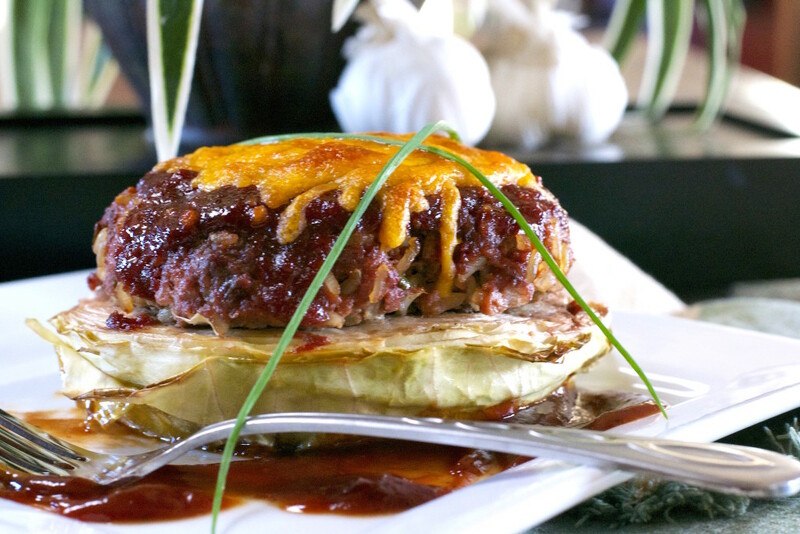 Bake in preheat 400* oven for 45-50 minutes or until the cabbage is tender crisp and the meat is completely cooked. 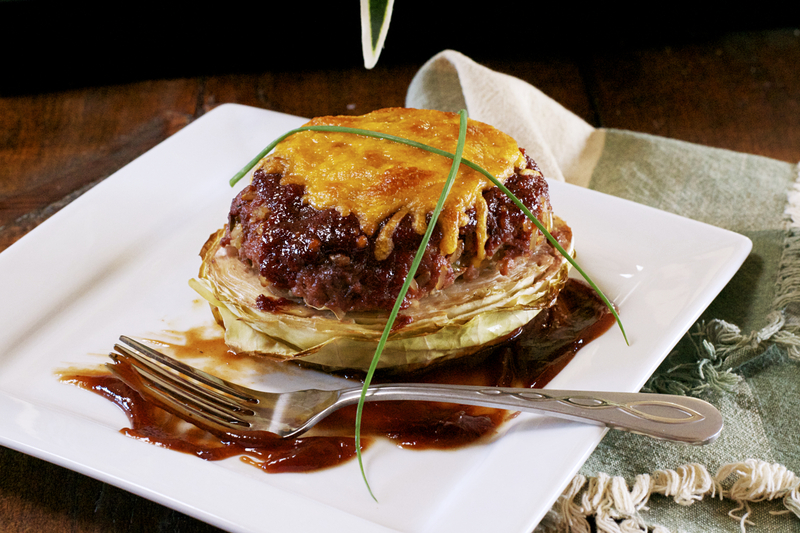 Remove from oven and place 1/4 cup of cheddar cheese on each cabbage roll. Return to oven for about 5 minutes until the cheese is melted. Place a spoon of the remaining sauce on four serving plate and place a cabbage roll on each plate. Serve.